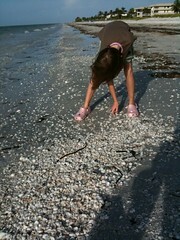 We slept in this morning, but the part of the island we are on had no shortage of little shells. We are headed to the west end of the island to look for larger shells. Hi there, thanks for telling me where to buy the posters. They work out at about $15 including postage - so a bargain really.